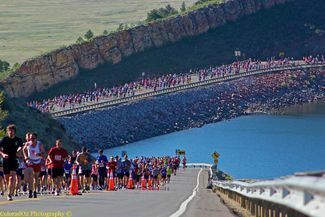 Thank you for your interest in volunteering at the 2019 Horsetooth Half Marathon on April 13-14. We appreciate any and all help you can give in helping race participants reach their athletic goals. Proceeds from the event help support the activities of the Fort Collins Running Club, a non-profit organization that has been promoting fitness through running in the local community since 1973. Funds from the race are also distributed to more than 10 other non-profit partners. Please check below for available opportunities, and THANK YOU! Help truck drivers set up aid stations. Deliver water, aid station boxes, mile markers, etc. Cover the course behind last runners. Pick up trash, gear and drop at aid stations. My wife jan Baby and I will do this and love it, thanks! Set up monster mountain infrastructure, Funnel Runners to hard shoulder after Monster Mtn Top Out. Help break down monster mountain arch and timing mats. Direct and help sponsor, food and rental setup, food service, and clean up.